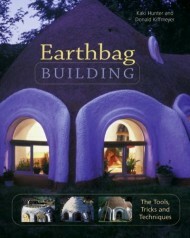 I applaud the authors and the publisher on the creation of a well organized, clearly written, lavishly illustrated and useful how-to book on the subject of earthbag building. They state the significant reasons for considering this technology, and then proceed to lead the reader through the basic steps of building this way. They write with well-grounded understanding of the physics and geometry of the subject as well as good humor. As they say in their Introduction, "The focus of this book is on sharing our repertoire of tools, tricks, and techniques that we have learned through trial and error, from friends, workshop participants, curious onlookers, ancient Indian nature spirits, and smartass apprentices who have all helped us turn a bag of dirt into a precision wall-building system that alerts the novice and the experienced builder alike to the creative potential within themselves and the very earth beneath their feet." only the solid adobe within them. The initial chapter that describes appropriate materials for earthbag building goes into how to find or prepare the right mixture of sand and clay to make good adobe soil to fill the bags. The tools and tricks that they describe all follow from the intention of using adobe soil as the basis for building. it becomes just another way to build with earth. From my experience, I know that earthbag building can be much more than this! For instance, I built my earthbag home by filling the bags with crushed volcanic rock (scoria), which has the huge advantage of being an insulating material. I know of others who have filled the bags with rice hulls, another natural insulating material. Doni and Kaki state that, "Filling the bags with pumice alone produces a lumpy bag full of loose material that refuses to compact while lacking the weight that we rely on for gravity to hold it in place. We prefer to maintain the structural integrity of the wall system first, and then figure out ways to address insulating options." Earthbag Building provides a good foundation for the basic concepts of building this way, starting with the foundation itself, and proceeding on to examine appropriate design features for walls. The merit of curved walls is clearly stated, as is the need for buttressing straight wall sections. The placement of barbed wire between the courses and how to keep it from being too unruly is covered. How to build corners, columns, door and window openings are all clearly shown. Even ideas for incorporating post and beam framing into an earthbag wall is discussed. I am particularly impressed with their use of "Velcro plates" of spiked wood inserted between the bags as a way to anchor door frames or other wall attachments. Also their use of wire mesh "cradles" where the bag ends are exposed, as under arches, makes a lot of sense for giving the eventual plaster something to hang on to. There are chapters on exterior and interior plasters, which they have much experience with and have many useful tips and recipes to reveal. There is a short chapter on poured adobe or rammed earth floors. There is a whole chapter outlining a variety of roof systems that can be integrated into an earthbag structure but, Doni and Kaki claim that domes are "where earthbags exhibit their greatest potential; to us, it is the essence of earthbag building. We are able to build an entire house from foundation to walls to roof using one system." I agree with them about this. The physics and geometry of dome building is well covered. They provide a step-by-step illustrated guide to how they built their 12 foot interior diameter "Honey House" dome. In the end the reader is given a wealth of information, gleaned from the authors' hard experience, in a manner that is quite readable and clearly illustrated. I can recommend Earthbag Building for anyone thinking about building this way, as long as the perspective is taken that what they present is only one of many ways that earthbags might be utilized for construction.